They are so alike that even their boyfriends struggle to tell them apart. 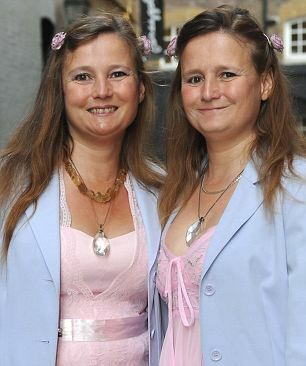 But Ruby and Pearl Day's other halves can be forgiven - especially since the pair were yesterday judged to be Britain's most identical twins. In a nationwide competition, the 18-year-olds were deemed to be most alike in terms of facial likeness, personality and 'dancing synchronicity'. The girls, from East London, are at college where they both happen to study the same subject - performing arts. They plan to spend the year ahead concentrating on their acting. Pearl and Ruby have already featured as extras in the fifth Harry Potter film, and will appear in the final instalment of the series. The twins share a bedroom at home, where they live with their mother and elder sister, and have seldom been separated from each other. Ruby said: 'People at school were always muddling us up and even now at college some people confuse us. 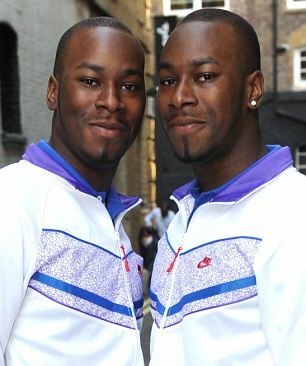 A series of challenges resulted in them being judged as the most identical of the 30 sets of twins to arrive at Pineapple Dance studios in London yesterday morning, in a competition held by Cadbury's Wispa Duo. Pineapple Dance teacher John Graham examined the twins' synchronicity, while cognitive neuroscientist Dr Fatima Felisberti judged the girls' facial likeness to be particularly close. Finally, former Big Brother twins Sam and Amanda Marchant - known as 'Samanda' - judged how alike the girls were in terms of personality. Ruby and Pearl stood out, Samanda agreed, for their equally bubbly personalities, a fitting trait for the girls now spearheading the bubbly chocolate’s advertising campaign. Pearl and Ruby pipped runners-up Ishmael and Nathaniel from East London and Tammy and Terri from Birmingham to the winning post, and will now take part in a Spot the Difference Tour of the UK.